A NATO defense ministers meeting that took place in Brussels on November, 8-9 resulted in the new and very important decisions for the future of Europe. Speaking at a meeting, Secretary General Jens Stoltenberg said it is vital that European roads, ports, bridges and rail networks are able to carry tanks and heavy military equipment. Stoltenberg also added that NATO countries have agreed to cooperate to improve civil infrastructure objects to make them usable for military needs. What does it mean in practice for Europe in general and for the Baltic States in particular? Lithuanian authorities, for example, will for sure try to attract NATO attention to the capabilities of its largest sea port – Klaipėda. As it is well known, that Klaipėda is one of the few ice-free ports in northernmost Europe, and the largest in Lithuania. It serves as a port of call for cruise ships as well as freight transport. The port was always an important gateway of trade between East and West. But times have changed. The gateway is open now only for the West. The East day by day refuses services because EU economic sanctions against Russia that Lithuania actively supports have caused Moscow response – redirection of its traffic to other ports. The more so Russian Ministry of Transport has declared that the redirection of Belarusian oil products from the Baltic ports to Russian ones will begin already in 2017. Lithuanian government has to seek new partners to raise money in order to support Klaipėda port experiencing difficulties due to loss of Russian and Belarus transit. Lithuanian government supposed to propose NATO the more active use of its largest port for NATO military purposes. Evidently that is the easiest way to cope with the economic problems by means of somebody else. As usual the authorities do not think about the consequences of such steps. The Baltic States have firmly established themselves as the most begging countries in Europe. An every new step in their foreign policy worsens image of States as the independent units on the international arena. The more so they continue to teases a Russian bear that will see in Klaipėda’s militarization the serious threat to its security. The image of main potential victim of Russia doesn’t make Lithuania stronger in the eyes of large political players and the time will come when nobody will take Lithuania as a self-sufficient partner. Making Klaipėda a military port Lithuania puts an end to any possibility to return Russian and Belarus goods to the port. NATO promises new roads, bridges, new railway networks, airports and sea ports but do not warn about new wave of misunderstanding and increasing security risks in the region. NATZO: “as the dog returneth to its vomit” so NATZO returneth to its old Nazi buddies in Lithuania Latvia Poland and Ukraina. NATO is a great problem for World Peace. It’s aggressive like Adolf Hitler. @Colin: “Lithuania is shooting itself in the foot.” Hope it does not prove too painful, given Lithuania’s Nazi past. But, like poor Adolph (“I should have led the Russians, not the Germans”), these sinister movements also have their comic aspect. For instance, a Spanish soldier under the Fascist regime regularly impressed foreigners with his bravery by shooting himself in the foot: he would hold the muzzle of his rifle to the toe of his boot, and fire. What the visitors did not know was, that oversize boots were regular issue in Franco’s army because otherwise the boots would not fit. I guess NATZO will supply the Lithuanian army with regular NATZO issue: the sort of weapons which demonstrate NATZO soldiers’ bravery and “our irresistible armed might” in gang rapes on small countries like Serbia and Libya, at a numerical advantage of 100:1. Good luck to the Lithuanians when they try that one on the Russia. This appears to be part of Stoltenberg’s “Military Schengen” strategy – an open border customs-free transition network for military materiel (currently on order in the US as part of the $4.6bn “European Deterrence Initiative”) All of this is based on tapping into resurrected deep psychological Cold War fears – that, then as now, are a baseless psyop. It’s not the Russians that aim to impose an alien and totalitarian rule in Europe: it’s Stoltenberg and his cronies (especially Mogherini) – under the guise of defending our common principles of freedom. This is linked to PESCO – EU (Mogherini’s) Permanent Structured Cooperation – which was signed into being yesterday. The UK did not sign (yet) – but we are the “flying buttress to the cathedral” – whatever dafuq that means in the peculiarly undecipherable idiom that is Borispeak. The EU is heading for a “more Europe” integrated defence strategy (watch for the expansion into the Sahel in Africa) – all to save us money. Which is kind of them. 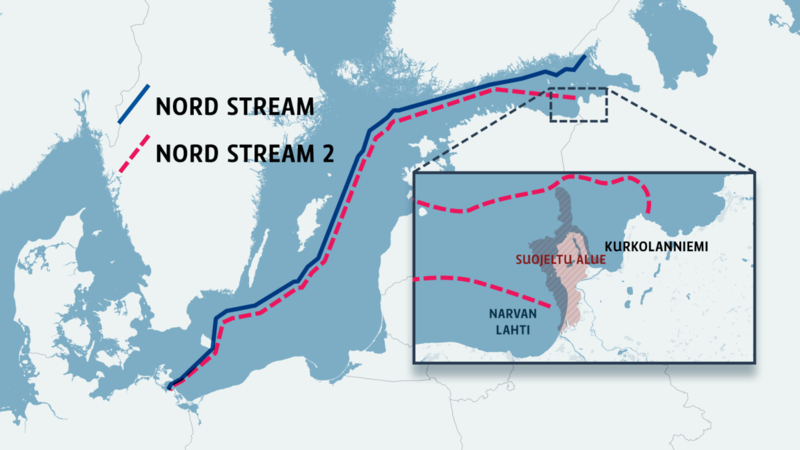 It’s possible that a NATO port at Klaipeda would be a convenient station for military submarines to sabotage the Nord Stream pipelines and disrupt the passage of gas from Russia to Germany. Lithuania is a major supporter of Ukraine and Ukraine is opposed to Nord Stream II as its completion would allow Russia to divert all gas supplies to northern Europe away from Ukrainian transit pipelines, especially if Turk Stream also becomes viable which would allow Russia to divert gas supplies to the Mediterranean region through the Black Sea and Turkey. (Then no gas would be passing through Ukraine at all.) The attraction of Nord Stream II is that it’s a much more profitable route for Gazprom and Germany and other northern European countries will get cheaper gas. As Ukraine’s economy sinks further into a black hole, Kiev will be ever more desperate to stop Nord Stream II and whatever Ukraine wants, Lithuania will not be far behind in support. That is frankly ridiculous, Jen. Sabotage would be an open act of war and there is certainly no need to build an entire port for that. Not to mention it would upset another NATO ally – Germany – who receives the gas. It’s funny seeing people criticize Western media for making conspiracy theories about Russia, because the same can be said about pro-Russians. So a debt defaulter has serious influence in the Kremlin does it? If Germany and Russia want Nordstream, it will happen. Surprising perhaps they dont chose Odessa? Maybe they know the money will disappear and nothing will get built? They planned on Sevastopol so they had to start again in the Black Sea…..
More likely they will kidnap all our women to impregnate them with Russian DNA….hell hath no fury like a Russian bear without six fillies to serve, eh? Lithuania is shooting itself in the foot. No other words for it. Sooner or later, it will realise that its future and its fortunes lie to the east. Perhaps they will become an American Crimea? Totally different of course as US has never had Imperial Grandeur, unlike those dreadful Russians…..